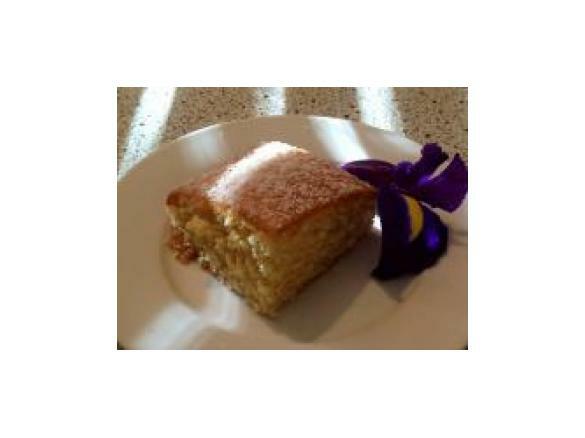 Lemon Coconut Cake by Nixter. A Thermomix <sup>®</sup> recipe in the category Baking - sweet on www.recipecommunity.com.au, the Thermomix <sup>®</sup> Community. Lightly grease a 20x20 square or round cake tin and line with baking paper. Add flour and juice of half a lemon, mix for 20 seconds Speed 5. Scrape inside of bowl, Add coconut and milk and mix for 20 Seconds speed 5. Pour batter into tin and cook for 35-40 minutes (check at 35 minutes) at 160 C.
Take out of oven and leave to cool in tin. Mill 120g Sugar for 10 seconds Speed 10 to make icing sugar. 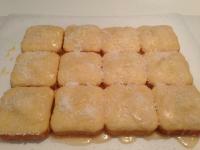 Slowly add icing sugar to juice of half a lemon, until glaze consistency forms. Stire well with back of spoon to remove lumps. With back of spoon spread over cake and top with a little extra coconut. Place in fridge until set. Submitted by Strawberrylover on 29. July 2017 - 13:24. Submitted by thermospa on 8. August 2016 - 03:07. It is perfect! Thank you for sharing! Submitted by Vanessa3082 on 7. August 2014 - 11:56. Delicious! I made 12 cupcakes with the recipe instead of a cake. Submitted by Dani75 on 6. August 2014 - 20:11. Submitted by Rosie1968 on 29. March 2014 - 11:34. I added juice of 1 1\2 lemons and it was perfect!! Submitted by SawJul on 5. May 2013 - 15:47. Lovely cake! I've made it twice in three days and my kids keep asking for more. Submitted by ziggyart on 29. March 2013 - 23:20. Submitted by LeahHall on 5. March 2013 - 10:55. So easy to make and I like it is on the cheaper side. Submitted by Abby11 on 18. September 2012 - 21:13. This cake is yum - it did turn out small, but its not a bad thing - i don't need a whole big cake hanging around waiting for me to eat it. Maybe more lemon next time. Submitted by Zannaevans on 24. June 2012 - 19:12. Submitted by Zannaevans on 24. June 2012 - 19:10. Submitted by Nixter on 22. June 2012 - 12:32. This cake is basically the EDC Best Coconut Butter Cake, ingredients HALVED, and prepared using the EDC Apple Tea Cake method and i have adjusted the baking method. The cake is small, and doesnt rise much, but is lovely, fluffy, delicious.